Delices/Boetica residents breathed an almost audible sigh of relief when a long-promised bridge was finally installed across the Boetica gorge, but residents of Victora/La Roche are now anxious for their turn. Construction of a Bailey bridge across the Boetica gorge was completed just before Christmas, bringing an end to the villagers' long wait and a series of promised dates of completion. Since the passage of Tropical Storm Erika in August last year, villagers were forced to cross the gorge by navigating a difficult bypass. They could only get goods, equipment and supplies to their communities via a zip-line that spanned the gorge. Some persons resorted to a dangerous crossing of the gorge on the zip-line. 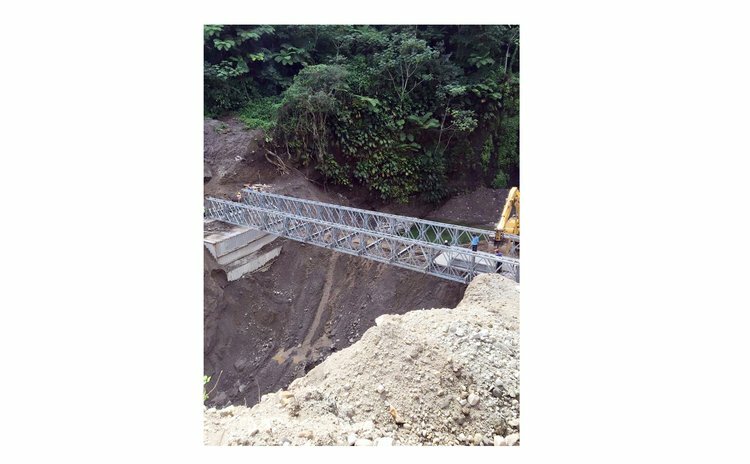 La Plaine Constituency representative, Petter Saint Jean told the Government Information Service (GIS) that the Bailey-bridge is only temporary and a permanent bridge will be built later. He also told GIS that the Government will now turn its attention to Victoria/La Roche where Tropical Storm Erika caused a culvert to collapse, destroying a large section of the roadway. Delices/Boetica residents said they now want Government to fix the road in front of and behind the bridge, which is difficult terrain for vehicles to pass through, especially when it rains. Meantime, Victoria/La Roche residents have intensified their calls for Government to build a bridge over a gorge that is seriously affecting access to their villages. Residents said the area's primary school is inaccessible and classes are now being held at the Youth Centre because the bypass to get in and out of Victoria/La Roche is too difficult for children. The Sun understands that even adults find difficult to navigate the bypass around the gorge, especially when it rains.